Lady Jane Grey [married name Dudley], (1537–1554), noblewoman and claimant to the English throne, was the eldest surviving child of Henry Grey, marquess of Dorset, later duke of Suffolk (1517–1554), and Frances (1517–1559), daughter of Charles Brandon, duke of Suffolk, and Mary, younger sister of Henry VIII. Jane was thus a cousin of Edward VI and about the same age, being born at Bradgate in Leicestershire in October 1537. She had two younger sisters, Katherine and Mary. The circumstances surrounding Jane's life and death inevitably made her an icon as a protestant martyr, and consequently have so coloured posterity's view of her that it is difficult now to see beyond the religious bias of such contemporary sources as Holinshed's Chronicles and Foxe's Acts and Monuments, or the uncritical later biographies of Agnes Strickland and Richard Davey. Jane's story also created considerable interest abroad, and there are three interrelated, near-contemporary, and sympathetic Italian accounts of her troubles. Although largely based on hearsay and gossip, these do contain some authentic touches and translations of letters whose originals have disappeared, and they have been drawn on by all later writers. Probably the only completely reliable and dispassionate contemporary account of her last days, however, is to be found in the so-called Chronicle of Queen Jane, written by an anonymous eyewitness. Jane showed early promise of exceptional academic ability, and when she was sent to join the household of the widowed Queen Katherine Parr in the spring of 1547 she was able to benefit from the educational opportunities then available in court circles for girls as well as boys. She was also encouraged to absorb the teachings of the evangelical protestantism of which Katherine was a leading devotee. Under the terms of Henry VIII's will Jane Grey stood presumptively fourth in line of succession to the throne, and as such she soon attracted the attention of Thomas, Baron Seymour of Sudeley, one of King Edward's maternal uncles and now just married to Queen Katherine. Ambitious and unscrupulous, Seymour saw Jane as a potentially useful weapon in his planned attack on his elder brother, the duke of Somerset, of whose position as protector he was fiercely jealous. He therefore opened negotiations with Dorset and a bargain was struck whereby Seymour gained custody of Jane in return for an undertaking that she would be placed in marriage ‘much to her father's comfort’. When Dorset asked for details, he was assured that ‘you will see he [Seymour] will marry her to the king’ (Haynes, 82–3). Jane had not been happy at home, but in the dowager queen's household she was treated with kindness, her piety and ‘towardness’ recognized and admired. In the summer of 1548 she accompanied Katherine down to Sudeley Castle and when the queen died in childbirth on 5 September, ten-year-old Jane Grey was chief mourner at the funeral. Although Thomas Seymour at first considered sending her back to her parents, he soon changed his mind. But the Dorsets were becoming impatient. More than a year had passed with no sign of Seymour's keeping any of his ‘fair promises’ and on 19 September the marquess wrote that he felt Jane was too young to be trusted to rule herself without a guide, and he feared lest ‘for want of a bridle she might take too much head’ and forget all the good behaviour she had learned from Queen Katherine. He therefore urged that she should be returned to the governance of her mother to be ‘framed and ruled towards virtue’ (Haynes, 78–9). This sudden access of concern for their daughter's welfare imperfectly concealed the Dorsets' determination to sell her to the highest bidder and they had begun to wonder whether it might not be wiser to settle for a match with the protector's son, which had already been tentatively discussed. Jane did go home for a short visit, but Seymour was not giving her up without a struggle. He went to see the Dorsets and, according to the marquess, ‘was so earnestly in hand with me and my wife that in the end, because he would have no nay, we were contented that she [Jane] should again return to his house’ (ibid., 76). Seymour also renewed his promise to arrange her marriage to the king and handed over another instalment of the £2000 he was paying for her wardship. For when I am in presence either of father or mother, whether I speak, keep silence, sit, stand or go, eat, drink, be merry or sad, be sewing, playing, dancing, or doing anything else, I must do it, as it were … even so perfectly as God made the world, or else I am so sharply taunted, so cruelly threatened, yea presently some times with pinches, nips and bobs … that I think myself in hell. Mr Aylmer, on the other hand, taught her so gently and pleasantly, and with ‘such fair allurements to learning’, that she derived more pleasure from her books with every day that passed (Ascham, 47). This famous passage is usually held to illustrate the harshness and lack of understanding shown by the Dorsets to their gifted daughter; it may equally illustrate the attitude of a priggish, opinionated teenager, openly scornful of her parents' conventional, old-fashioned tastes. Jane's reputation for scholarship grew as, encouraged by Aylmer and Ascham, she began to correspond with various German and Swiss protestant divines, and in July 1551 she is found thanking Heinrich Bullinger, chief pastor of the radical church of Zürich, for sending her a copy of his treatise on Christian perfection, a little volume of ‘pure and unsophisticated religion’. She was also just starting to learn Hebrew, so as to be able to read the Old Testament in the original, and asked Bullinger for advice on how to pursue this study ‘to the greatest advantage’ (Nicolas, 8, 10). In October 1551 Dorset was created duke of Suffolk and Lady Jane was now more often at court, being present with her parents at a state banquet given in honour of Mary of Guise, the Scottish queen dowager. Neither of the king's sisters, Mary and Elizabeth, had been invited on this occasion, but the duchess of Suffolk was friendly with Princess Mary and, despite their growing religious divergence, kept in regular contact with her. Jane, though, never compromised. Presented with a rich gown of tinsel cloth of gold on velvet by the princess, she refused to wear it, saying that ‘it were a shame to follow my Lady Mary against God's word and leave my Lady Elizabeth which followeth God's word’ (Strype, 195–6). Elizabeth at this time affected a severely plain style of dress, setting the fashion for other high-born protestant maidens. In the summer of 1552 the Suffolk family was staying with Mary when, according to protestant tradition preserved by John Foxe, Jane once more made her position clear. She was, so the story goes, walking through the princess's private chapel with the wife of one of Mary's officers. Seeing her companion curtsey to the altar where the host was exposed, Jane asked if the Lady Mary had come in. ‘No’, was the reply, ‘I made my curtsey to Him that made us all.’ ‘Why’, said Jane, ‘how can that be, when the baker made him?’ (Acts and Monuments, 8.700). After the execution of Thomas Seymour and the subsequent fall of Protector Somerset, the duke and duchess of Suffolk threw in their lot with the new strong man, John Dudley, duke of Northumberland. Then, as the king's health began to fail, they connived with the plot being laid to exclude the princesses from the succession. Edward, determined to prevent the Catholic Mary from succeeding, made a will passing over both his half-sisters in favour of the so-called Suffolk line and, after some debate, bequeathed the crown to ‘the Lady Jane and her heirs masles’ (Nichols, Literary Remains, 571–2). In order to secure his hold on power, Northumberland had arranged with the Suffolks that Jane should marry his own son Guildford Dudley (c.1535–1554). Jane at first tried to resist, on the grounds that she believed herself already contracted to Somerset's son, the earl of Hertford. But her protests were overborne and her submission extorted ‘by the urgency of her mother and the violence of her father, who compelled her to accede to his commands by blows’ (Strickland, 136, citing Giulio Rosso). The marriage took place on 21 May 1553 at Durham House, the Dudleys' London residence, and afterwards Jane went back to her parents; but the duchess of Northumberland soon became impatient, telling her that the king was dying and she must hold herself in readiness for a summons at any moment, because he had made her his heir. According to her own account, Jane did not take this seriously. Nevertheless she was obliged to return to Durham House. After a few days she fell sick and, convinced that she was being poisoned, begged leave to go out to the royal manor at Chelsea to recuperate. She was still there when King Edward died on 6 July. Three days later one of Northumberland's daughters came to take her to Syon House, where she was ceremoniously informed that Edward had indeed nominated her to succeed him. Again according to her own account, given in a letter to Queen Mary which has since disappeared but which survives in an Italian translation by Pollini, Jane was ‘stupefied and troubled’ by the news, falling to the ground weeping and declaring her ‘insufficiency’, but at the same time praying that if what was given to her was ‘rightfully and lawfully hers’, God would grant her grace to govern the realm to his glory and service (Stone, 497–8). Next day, 10 July, Jane was conducted in state down river to the Tower, where an Italian spectator, witnessing her arrival, described her as being ‘very short and thin, but prettily shaped and graceful. Her hair was nearly red, her complexion good but freckled, and her teeth, when she smiled, white and sharp’ (Davey, 253). Guildford Dudley, ‘a tall strong boy with light hair’, walked beside her and paid her much attention, but Jane stubbornly refused to make him king, reputedly saying that ‘the crown was not a plaything for boys and girls’ (ibid., 260). This led to a first-class family row, and it was apparently only then that she began to realize the full extent to which she had been made use of by the Dudleys. ‘Thus in truth’, she wrote, ‘was I deceived by the duke [of Northumberland] and the council and ill-treated by my husband and his mother’ (Stone, 499). Jane was proclaimed queen at the Cross in Cheapside, a letter announcing her accession was circulated to the lords lieutenant of the counties, and Bishop Ridley of London preached a sermon in her favour at Paul's Cross, denouncing both Mary and Elizabeth as bastards, but Mary especially as a papist who would bring foreigners into the country. Although Jane was proclaimed as far away as the Channel Islands, and some of the London companies entered her accession in their records, it was noticeable that there were no signs of rejoicing over the new reign, none of the usual bonfires and bell-ringing, and then on 12 July news arrived that, against all the odds, Mary's friends in East Anglia were preparing to put up a fight. Plans were hurriedly made to send the duke of Suffolk to suppress them, but Jane intervened and ‘with weeping tears, made request to the whole council that her father might tarry at home in her company’ (Nichols, Queen Jane, 5). Consequently it was Northumberland who rode out to fetch in the Lady Mary, but popular feeling was against him, his army began to melt away, and three days later Mary was being proclaimed throughout the country. The duke was brought back a prisoner to the Tower, where Jane, too, was now under arrest. To begin with the new queen was ready to be merciful, telling a disapproving imperial ambassador that her conscience would not allow her to have Jane put to death, although she promised to take every precaution before setting her free. Jane, together with Guildford Dudley and two more of his brothers, stood trial for treason on 19 November. The proceedings were brief and formal and the accused duly condemned, but the emperor's ambassador reported that Jane's life would be spared. Then came Sir Thomas Wyatt's rebellion of late January and early February 1554 in which the duke of Suffolk, who had been pardoned by Mary, was foolish enough to take part. His action helped to seal his daughter's fate, for although the rebellion was principally directed against Mary's forthcoming marriage to Philip of Spain and no one ever suggested that Jane had any foreknowledge of it, her very existence as a possible figurehead for protestant discontent made her an unacceptable danger to the state. The queen could no longer afford to be merciful and Jane's execution was fixed for 9 February, but in a last-minute attempt to save her cousin's soul, if not her life, Mary sent John Feckenham, the new dean of St Paul's, over to the Tower with a few days' grace to see if he could convert this obdurate heretic. Feckenham had a reputation for persuasiveness and Jane received him politely, preparing to engage in the stimulating cut and thrust of theological debate for the last time. The account of their confrontation has survived in the pages of Foxe, and naturally gives the victory and the last word to Jane, but the contestants parted amicably, with mutual expressions of regret that they would not be able to meet again in the hereafter. Jane and Guildford were ultimately both to die on 12 February 1554. He on Tower Hill, she, as befitted her royal rank, within the precincts of the Tower, where she was also buried, on the same day, at St Peter ad Vincula. It is said that she had refused an offer from the queen to allow her to see her husband to say goodbye. She did, though, stand at her window to see him taken away and insisted on waiting there until the cart containing his headless corpse returned. She then came out leaning on the arm of the lieutenant of the Tower. Her two women attendants were in tears, but Jane herself appeared dry-eyed and composed. Mounting the steps of the scaffold, she turned to address the small group of onlookers. She admitted she had done wrong in agreeing to accept the crown, but went on, ‘touching the procurement and desire thereof by me or on my behalf, I do wash my hands in innocency, before God and in the face of you good Christian people this day’. She asked those present to witness that she died a good Christian woman and to assist her with their prayers while she was alive. Even in that last dreadful moment she could find the strength to remain true to her principles and reject the age-old comfort of prayers for the dead. Kneeling, she repeated the 51st psalm, the Miserere, in English ‘in most devout manner’ to the end. The headsman stepped forward and she saw the block for the first time. Her women helped her off with her gown and gave her ‘a fair handkercher to knit about her eyes’. Groping in the dark she cried out ‘Where is it? What shall I do?’ Someone came forward to guide her and ‘she laid her head down upon the block and stretched forth her body and said: “Lord, into thy hands I commend my spirit!” And so she ended’ (Nichols, Queen Jane, 56–9). The judicial murder of sixteen-year-old Jane Grey, and no one ever pretended it was anything else, caused no great stir at the time, not even among the militantly protestant Londoners. Jane had never been a well-known figure, and in any case was too closely associated with the unpopular Dudleys and their failed coup to command much public sympathy. But there is a tradition that the oak trees in Bradgate Park were pollarded in a gesture of mourning and defiance when news of her beheading reached Leicestershire, and the story circulated that Sir Richard Morgan, the judge who had passed sentence on her, died in delirium the following year, crying ‘Take the Lady Jane from me! Take away the Lady Jane!’ (Holinshed's Chronicles, 4.23). With one possible exception in the National Portrait Gallery, London (it is now generally considered to represent Queen Katherine Parr), there does not appear to be a single reliably authenticated portrait of Jane Grey in existence. 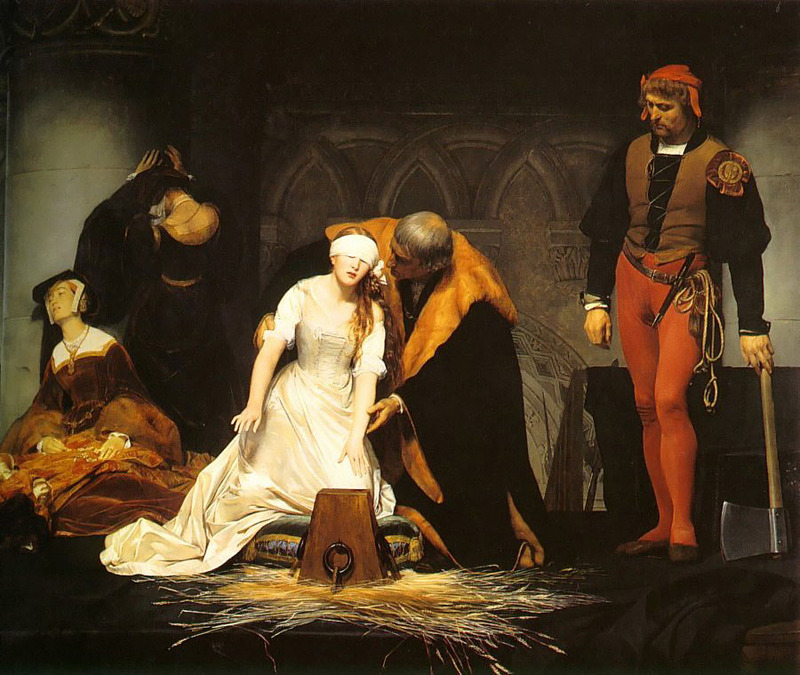 Much later paintings like the Execution of Lady Jane Grey by Paul Delaroche in London's National Gallery, and the various engravings which appeared in nineteenth-century biographies, all helped to perpetuate the image of gentle Jane, the protestant heroine, saint, and martyr, created for the edification of Victorian schoolrooms. The Victorians did, however, have some difficulty with her vitriolic denunciation of her first tutor, Dr Thomas Harding, who had cravenly returned to the Catholic fold, refusing to believe that such terms of vulgar abuse as ‘deformed imp of Satan’, or ‘unshamefaced paramour of AntiChrist’ could have issued from the pen of an amiable young female (Nicolas, 22). But the brilliantly gifted child had developed into a forceful, passionate young woman, all her overflowing intellectual energy devoted to a total commitment to her religious ideology, and the reality of Jane Grey, sacrificial victim of realpolitik though she undoubtedly became, was surely rather more disturbing than the sentimental myths surrounding her seem to suggest.